we allocated to the first two levels of the road network their numbers and names, and the remaining three levels of roads carry the categories ’byroad1’, ‘byroad2’ and ‘byroad 3’ as their attributes. name labels of agglomerations, landscape units, waters, railways, pass-through roads, outbound roads, city sections, spectacles, cemeteries, streets, districts. 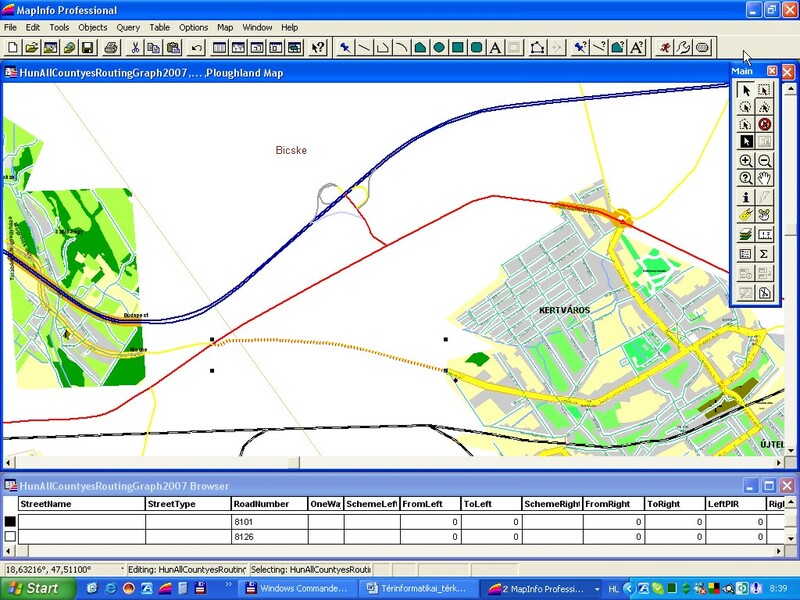 graphic objects of motorways, express roads, pass-through roads, main roads, roads, small roads, pedestrian streets, squares. lines of chairlift, cogwheel tram and railway network, lines of the suburban railways (HÉV), metro, tram, bus and trolleybus routes. 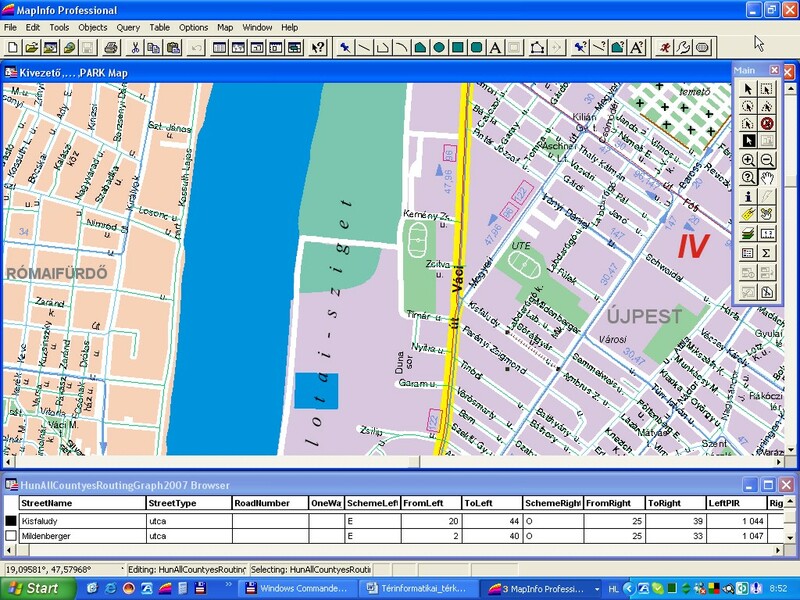 Data that are connected to the street centre line sections: name and type of public territory, number of public road, in the case of cities data concerning one way traffic and traffic allowed, attributes of the increasing of the right and left side house numbering, data of the block corner house numbers of the right side and the left side, county, settlement, city section and district information, length of the graph edge. The graphic objects of plough-lands, fields/grasslands, gardens, farmlands, forests, built-in areas, reed-lands, cemeteries, special buildings, parks, rivers, lakes, the streets, roads and the labels of the national road network, railway network, waters, squares, streets, roads, city sections, outbound road directions, and the other items. 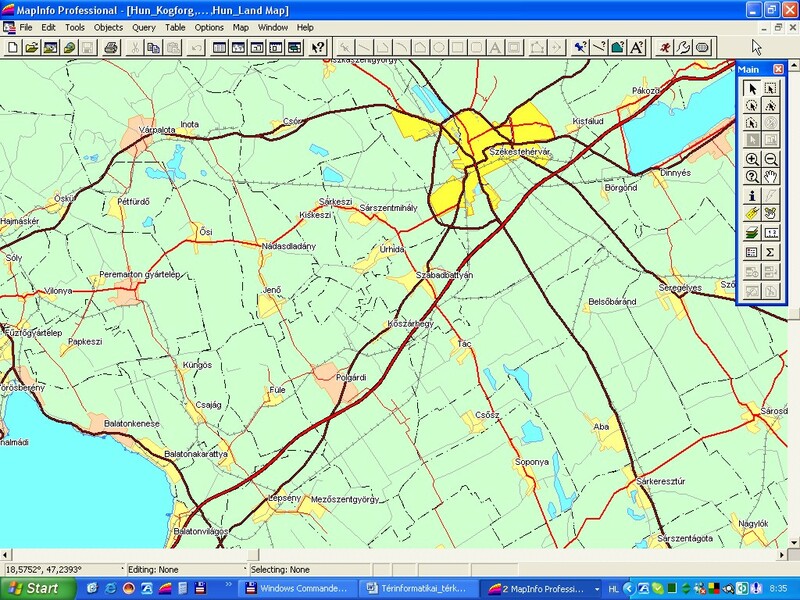 The national public road network had been integrated with the street network graph on the basis of nodes; therefore with the aid of our database it is possible to prepare routings as well.